We have just a few Easter traditions at our house. These include Easter baskets for the girls, pretty new spring dresses to wear to church (if we’re able to find them in the stores in time! ), and a special meal for Easter lunch. 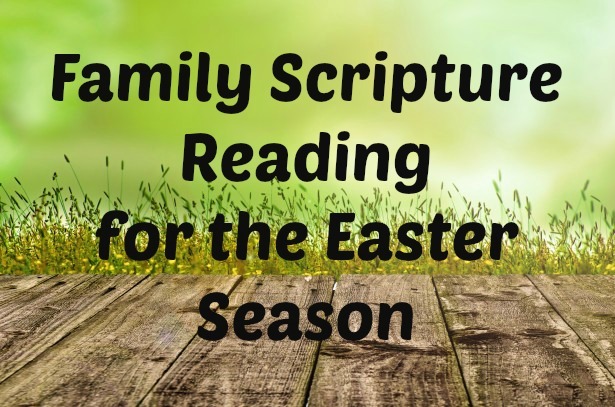 This year we’re beginning a new tradition that I hope will become a special part of the season because it points us to what Easter is all about – the suffering, death, and resurrection of Jesus Christ. For the week leading up to Easter, we’re going to read passages nightly from each of the gospels about what happened in Jesus’ life in the days before His crucifixion. I wrote out a schedule listing the topic and Scripture passage for each night for seven days. The eighth day has the gospel accounts of the resurrection and will be perfect to read together on Easter Sunday. If you’d like to print this Bible reading plan, I’ve made a printable PDF you can access through the link below. What Easter traditions do you have in your family? We don't have any Easter traditions, so we need to get some. The book I reviewed on my blog today will probably become one! It's that good! Thanks for putting these Scriptures together! What a great plan. Thanks for making it available. We always do baskets and new or new to us dresses for the girls. I missed this post earlier & am so glad I came back to it! Excellent scriptures!